Adventure on an exotic Arabian journey with the latest eyeshadow palette by Huda Beauty. This richly toned palette features 18 versatile shades that can be layered in infinite ways to create a vast array of looks with just one palette. Layer different textures to create unique combinations or add intrigue to smooth matte shades with a duo-chrome topper. From subtle, natural looks to dramatic statements and bold glittering looks, this palette will become your new essential for all your makeup routines. 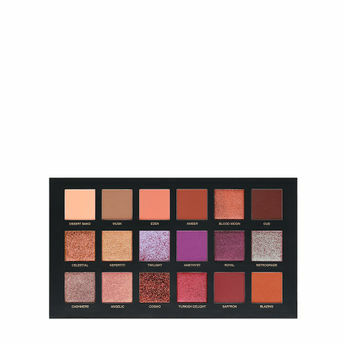 - A dynamic eyeshadow palette with 18 shades in 4 unique textures: 1 dazzling glitter, 8 creamy mattes, 6 shimmering pearl shades and 3 duo-chrome toppers. Concept : "Our second palette is filled with vibrant, highly-pigmented shades that reflect the exotic landscape of the Arabian desert around us. We've introduced three new formulas to reflect all its dazzling mystery and charm, in particular the iridescent duo-chrome formulas just completely capture the mysterious desert mirages. I spent so much time to ensure that every shade was absolutely perfect, and every color is so special to me. It was also really important to me that we take all our knowledge and feedback from our first palette, and create something that would showcase our growing experience and knowledge''. - Huda Kattan, Brand Founder. About The Brand :Huda Kattan is one of the most internationally recognised makeup gurus and content-creators. She is an award-winning makeup artist, blogger and vlogger. Guided by her expertise and eye-for-detail, Huda Kattan founded her record-breaking global brand Huda Beauty in 2013. Since then, Huda Beauty has become the No.1 Beauty Instagram account with over 20 million followers. Kattan is constantly creating ground-breaking products as she continues to build and reinvent the beauty empire. Explore the entire range of Eye Shadow available on Nykaa. Shop more Huda Beauty products here.You can browse through the complete world of Huda Beauty Eye Shadow .